I’ve made some wonderful friends through Twitter and just a few weekends ago, I got to share one of these friendships with many of my old friends. Ryan and Ben, (@rzhale and @joubiku, respectively on Twitter) came into town for a weekend away from the bustling city life that is Kansas City, ahem. The weekend had been heavily anticipated for all involved for a few weeks and as the days closed in the anticipation grew to astronomical proportions. I welcomed them to their new home for the weekend, my apartment and shortly after their arrival we headed down to Shakespeare’s Pizza (@ShakesPizza) for some dinner, drinks and a fun environment. After pizza we stopped by Top Ten Wines for a few minutes before ultimately heading back to my apartment for wine, cookies and hours of hilarious YouTube videos. I don’t’ think Phoebe (@fotofobe), Josh (@brooding_soul), Ryan, Ben or I had ever laughed as hard in our lives. One of the most entertaining evenings in I’ve ever had. Phoebe and I decided we should share our new addiction to Cafe Berlin (@CafeBerlin) to Josh, Ryan and Ben. 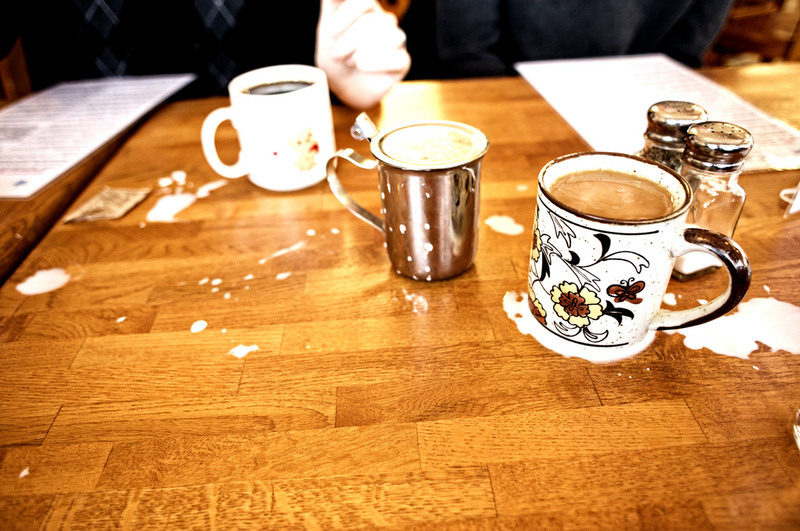 Amazing breakfast, delicious food, fun, waitstaff and a comically difficult cream dispenser. That evening was Cake and a Movie Night (#CaaM). 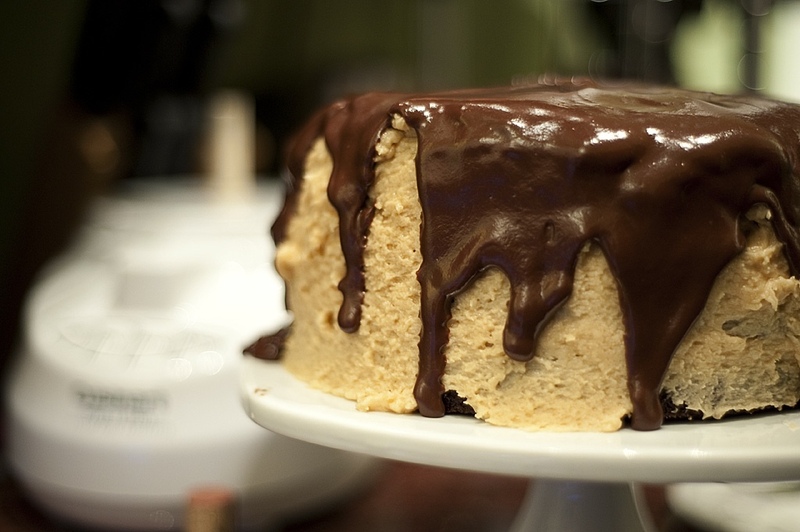 I made a Chocolate cake with peanut butter frosting and a bittersweet chocolate-peanut butter ganache. 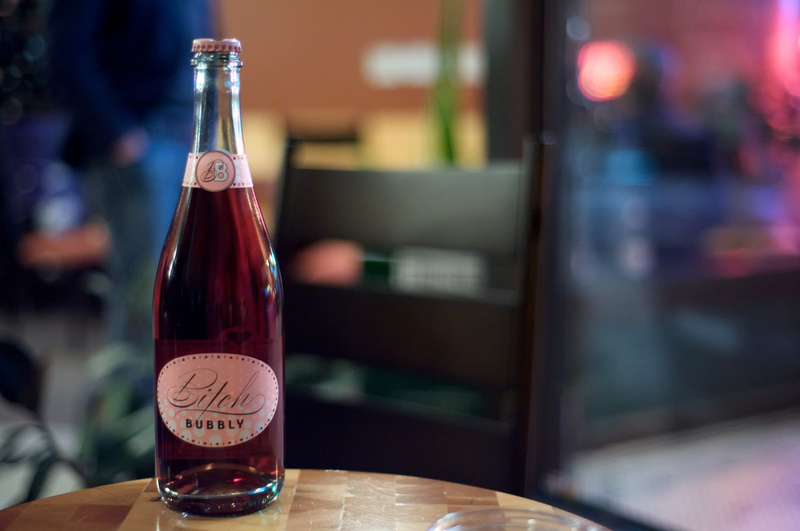 Before Cake and a Movie, we headed out for wine drinking at Top Ten Wines downtown (@TopTenWines), my absolute favorite wine bar, where Chase (@clettenberg) performing. Yet again, Chase put on a great show and as per usual, Lauren (@laurenkilberg) proved to be a fantastic wine maiden. Cake and a Movie had a great turn out, some regulars and some new attendees. My Ryan (@kaleb1983) finally got to join us for the weekend festivities. We watched Toy Story, the Pixar film that put them on the map. Wow, who would have known how funny that movie would be, over ten years later. I sure wasn’t expecting all the laughs. The next morning, Ryan, Ben, Ryan and I went to Bleu for a brunch before Ben and Ryan had to head out of town. Seems I spent most of today organizing my apartment to where it was when the semester started. I like to live in as clean a place as possible but with the holiday travels, a hectic school and work schedule and just life happening, my place had began a slow decline in cleanliness. Martha would have been disappointed. Plus I have two really special guests visiting this weekend as well as a Cake and a Movie night! So I took to cleaning it up today including hanging some new pictures, installing new light bulbs (haha), installing new shelves, organizing what’s left of my wine collection and the regular dusting/vacuuming I do on a regular basis. So, I’ve mentioned it a few times here and have even posted pictures of the cakes here but, now officially, a post just about Cake and a Movie. I started Cake and a Movie Night during Winter Break… I was bored and had all these ingredients so there we go, baked a cake. Then made the call, invited a bunch of friends over and we watched a movie. Now it has grown through Twitter and the hashtag, #CaaM. Each week I have about 20 or so people over, we drink wine, watch a movie and eat cake. So, I built a site to keep up with it! Check it out! My friends Karen (@ok2bapincess) and Josh (@brooding_soul) help with the site by writing wine and movie reviews. I post all the recipes I use/create along with photos of the cake and the process. You can even vote on which movie we watch! Anyways, just wanted to put the info out there, the site is up and running and growing every week. Thanks for checking it out! I’ve got another recipe for you guys. This one I made for the last Cake and a Movie night. We watched the movie, Hard Candy. Wow. This film was incredibly well done. Razor sharp, absolutely awesome… But not for the weak stomach at times. Definitely not a movie you’d pair with a carrot cake. It might be better paired with a glass of Vodka. Straight up. We had a great group of people come over, 15 in all, though not all stayed the entire time. 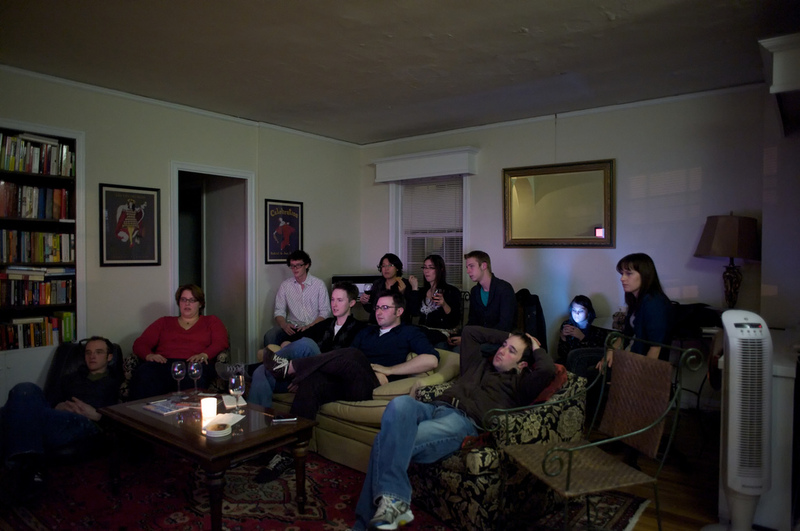 The movie got off to a late start as we couldn’t stop talking and socializing… not a bad problem at all! And now for the cake! This is a really great cake and holds a few firsts for me, mostly an original recipe and my first carrot cake. I was a little nervous about it coming out but it did just fine! A very forgiving formula, light and fluffy yet miraculously dense where it matters. The cake is spicy and moist, the frosting sweet and creamy. Let’s get to it! Start by washing, peeling and grating carrots, the smaller the shreds of carrots the better. Put aside. In a stand mixer, whisk together the flour, baking soda, salt, cinnamon, nutmeg and ginger until well blended. Add sugar and oil until well blended, batter will be thick. Add in eggs one at a time, ensures a consistent batter. Scrape the batter from the sides of bowl and add carrots, let this mix until smooth and well blended. Spray three 9-inch-diameter cake pans with baking oil (I prefer to use the kind with flour). Line bottom of pans with parchment paper. Spray parchment paper as well. Divide the batter between the prepared pans, about 2 ½ cups per pan, and bake the layers for about 40 minutes each, or until a tester inserted into center comes out clean. Cool cakes in pans 15 minutes before placing in the freezer while you make the frosting. Using the stand mixer, whisk all the ingredients on medium until fluffy and smooth. Chill the frosting for 10 to 20 minutes, until it has set up enough to spread smoothly. Frost the flat top of the first layer and add the second, and then the third and finally, frost the sides of the cake. Place in the refrigerator until ready to cut and serve. 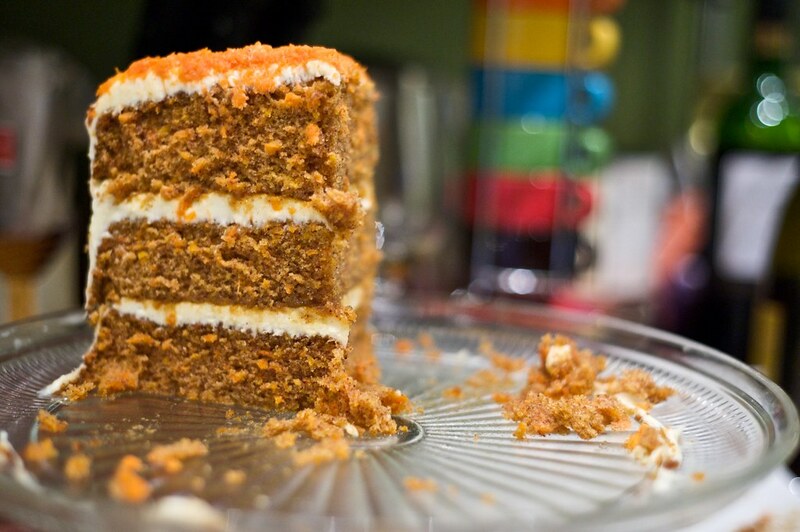 I choose to top the cake with some extra carrots that I shredded with a micro-plane to create these tiny, soft, bright orange carrot topping. You can see the entire process in this slideshow. I hope you enjoy this cake! Let me know if you bake it or have any suggestions. I didn’t include nuts in this cake because I’m allergic and no raisins because some of my regulars have voiced their opposition to the raisin haha. It’s a HUGE cake when all is said and done. So tall that my glass dome wouldn’t sit on top. It’ll end up being about 6-7 inches tall, 9 inches wide. Mine served 15 with two slices to go, and we went with some really thick slices. You could easily serve up to 20 people with a cake like this. Also, try substituting half the oil for applesauce or yogurt. You can also use fat free cream cheese for the first 16oz (if you do all fat free the frosting won’t have the proper consistency). You can even cut the sugar by using Splenda’s baking sugar substitute. Do all of this and it’s the perfect cake for those looking at their waistline after a few Cake and a Movie nights have hit their belt! It’ll still taste great and be super moist, I promise! Wow, this Cake and a Movie thing seems to be taking off, at least on Twitter. There are reports of #CaaM being held from California to Illinois to North Carolina to Florida and all the way across globe in Australia. How awesome is that? I registered CakeandaMovie.com today but haven’t decided how I want to build it out. Another WordPress blog? A Joomla or Drupal content management system? I’m taking ideas from anyone that has them. With this site I want to help other people host their own Cake and a Movie gatherings with movie reviews, recipes, tips… etc etc. I’d love to figure out a way to have a live stream of the #CaaM hash tag from Twitter. Anyone know how to do this? Another cool feature would be for people to post their Cake and a Movie events for others to join, a GoogleMaps integration would be great. Plus people could submit their movie reviews and recipes, how fun would that be? Make this whole #CaaM thing go big. I feel that in a time where there is so much uncertainty, when we are all a little bit down, something like this could be the very thing that helps pull us up. Sometimes it’s just the simple things. Plus… these get-togethers are a blast! Just search for #CaaM on Twitter and see what everyone is talking about! Michael (@mdanbom) joined me in making this delicious cake for the last Cake and a Movie night (#CaaM) which happened last night. @laurenreid, @aurablush, @taylorjm10, @ok2baprincess, @brooding_soul, @savannahbrooke and @coreyschmidt. It was suggested that we watch Nick and Norah’s Infinite Playlist and it was a great film. But I’m a sucker for Michael Cera and Kat Dennings; oh and any movie with a band full of really hot gay guys, especially when the gay characters aren’t so annoying. Now I guess it’s time to post my Sour Cream-Chocolate Cake with Peanut Butter-Cream Cheese Frosting and Chocolate-Peanut Butter Ganache. This is an original of Sky High: Irresistable Triple-Layer Cakes modified by the SmittenKitchen.com and further adopted by me. Preheat the oven to 350 degrees F. Butter the bottoms and sides of three 8-inch round cake pans. Line the bottom of each pan with a round of parchment or waxed paper and butter the paper. Sift the flour, sugar, cocoa powder, baking soda, and salt into a large bowl. Whisk to combine them well. Add the oil and sour cream and whisk to blend. Gradually beat in the water. Blend in the vinegar and vanilla. Whisk in the eggs and beat until well blended. Scrape down the sides of the bowl and be sure the batter is well mixed. Divide among the 3 prepared cake pans. Bake for 30 to 35 minutes, or until a cake tester or wooden toothpick inserted in the center comes out almost clean. Let cool in the pans for about 20 minutes. Place cakes in freezer for thirty minutes. This will allow these incredibly soft, moist cakes to firm up before frosting. Now is a good time to make the frosting. In a large bowl with an electric mixer, beat the cream cheese and butter until light and fluffy. Gradually add the confectioners’ sugar 1 cup at a time to prevent lumping. Mix thoroughly after each addition and scrape down the sides of the bowl with a spatula often. Continue to beat on medium speed until light and fluffy. Add the peanut butter and beat until thoroughly blended. Use the spatula to fold frosting to ensure it is smooth and creamy. Frosting a dark cake with a light frosting can be difficult. Here are some tips to make this as easy as possible. Measure out just enough frosting to put a thin layer of frosting on the cake using an offset spatular. Microwave frosting for 20-30 seconds to make frosting soft and spreadable. Let this cool on the cold cake, firming up the frosting and preventing any rips in the cake. Place one layer, flat side up, on a cake stand or large serving plate. Spread about 1/2 cup of the frosting evenly over the top. Repeat with the next layer. For a smoother frosting, use 1/2-2/3 of the remaining frosting to finish up the top and sides, reserving 1/3-1/2 for later. Place layered cake into the refrigerator for 15-20 minutes. Warm frosting in microwave for 20-30 seconds before smoothing the rest of the frosting on the chilled cake. 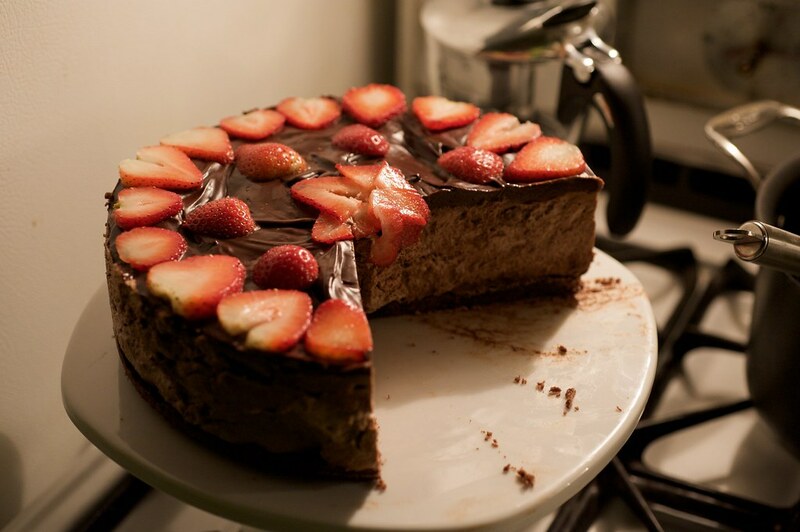 Place cake back into the refrigerator while you prepare the ganache. In the top of a double boiler, combine the chocolate, peanut butter, and corn syrup, whisking often, until the chocolate is melted and the mixture is smooth. Remove from the heat and whisk in the whipping cream, beating until smooth. Let the ganache sit for a few minutes. It should be warm but not hot when applied to the cake. Slowly pour the ganache over the top of the cake, and using an offset spatula, spread it evenly over the top just to the edges so that it runs down the sides of the cake in long drips. Refrigerate, uncovered, for at least 30 minutes to allow the glaze and frosting to set completely. Use warm, sharp, thin knife to slice the cake, cleaning between each slice with warm water and dry towel. This will make each slice as beautiful as the first. Let me know how it works for you and if you have any suggestions for modifications or cake suggestion for the next Cake and a Movie night. So far it sounds like a carrot cake is winning out. If you’ve got a great recipe, send it over! 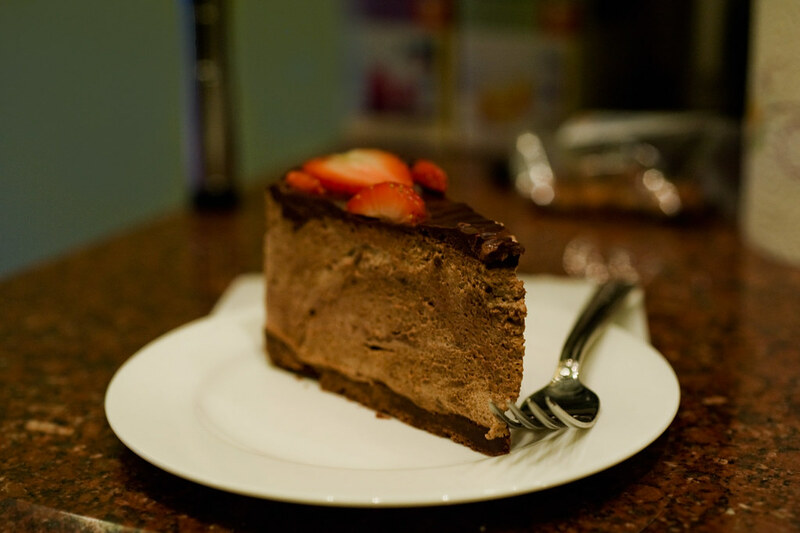 This is my version of the popular Chocolate Hazelnut Mousse cake from Gourmet magazine, February 2006. I like a thicker, richer mousse and sturdier, easier to cut through crust. Everyone seemed to just love this mousse, sure to be a winner. Make your slices thin, this thing is RICH! I like to garnish it with fresh, thinly sliced strawberries but a light dusting of dutch process cocoa and/or powdered sugar makes for a great, simple decoration. Preheat oven to 350°F. Cut a piece of parchment paper to fit the spring-form pan with a 1″ tab. Close spring-form with tab going through the bottom of the pan. Coat pan with baker’s non-stick spray. Bake hazelnuts at 350°F in a small pan for ~10 minutes. Remove hazelnuts and wrap in a towel. Let sit for two minutes. Massage the towel to remove the skins from the toasted hazelnuts, not all skin will remove. Pulse hazelnuts with sugar in a food processor until hazelnuts are finely chopped. Add flour, butter, cocoa, and salt and pulse until dough forms..
Press dough evenly onto bottom of springform pan with your fingers. Bake crust for 15-20 minutes, until edges are dry with the center still slightly moist. Remove from oven and let cool., about 30 minutes. Sprinkle gelatin over water in a medium sized heavy saucepan and let stand until softened, about 5 minutes. Heat and stir gelatin just until melted over medium heat. Whisk in chocolate hazelnut spread until combined and remove from heat. Add mascarpone to the chocolate hazelnut mixture. In a large, chilled bowl, beat together cream, cocoa powder, and sugar with an electric mixer at low speed, increasing speed to high and beat until cream holds soft peaks. Line the sides of the springform pan with parchment paper, feel free to use bakers tape on the exterior side of the parchment paper to keep the paper together. Fold in whipped cream mixture into the hazelnut mixture in the saucepan until well combined. Spoon filling onto shortbread base in pan, gently smoothing top with an offset spatula. Cover and chill in a freezer for 2-3 hours or until center is firm to the touch. 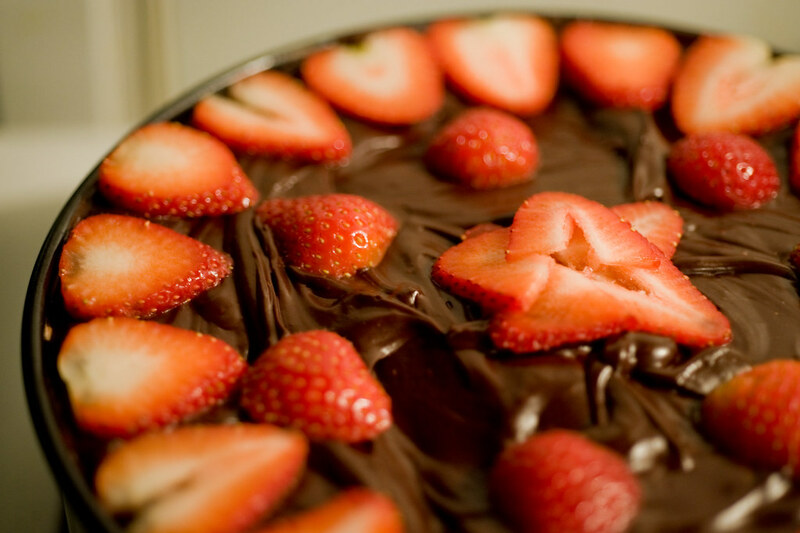 After mousse if firm… Bring cream to a simmer in a small heavy saucepan and remove from heat. Slowly and with even distribution, add chocolate pieces. When chocolate has begun to melt into the cream, slowly whisk until completely melted and smooth. Allow ganache to chill for 15 minutes before pouring over chilled mouse. Add any garnish, sliced strawberries, raspberries, chopped hazelnut, etc. Place covered mouse back into freezer or refrigerator for 45 minutes to an hour before serving. For a firmer, easier to serve mouse, use the freezer. Release springform sides from the cake base and peel parchment paper from the sides of the cake. Using the tab from the parchment paper, pull the cake from the springform base and onto a serving plate. Slice cake with a chilled knife, cleaning blade between each piece.